Flu season is here and germs are everywhere. School restrooms often get extremely dirty and are the best place to recycle bacteria. 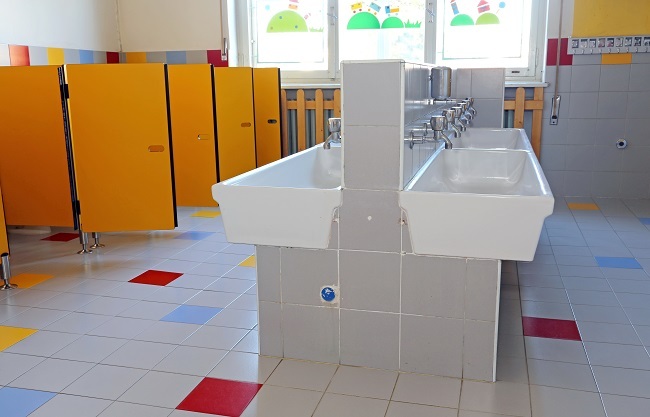 Here are six tips for keeping your school restrooms clean. Educate students on proper hygienic procedures. For example, teach them not to throw too much paper towels in the toilet. Make sure they know how to wash their hands properly. It may be helpful to install signs in the restrooms and washing areas to remind students to keep things clean. You can keep germs at bay by making sure the restrooms are stocked with soap. Another way to reduce germs is by using automated sensors to turn on the sinks and flush the toilets. This will make it unnecessary for the students to touch them. You can reduce floods by using waterless urinals. Using automated sensors for your sinks and toilets, besides reducing the spread of germs, will also lead to less water usage. When a toilet or sink gets clogged or starts leaking, make sure to fix it right away. A common problem is when students fail to throw paper towels in the wastebasket and just leave them lying around. Using air dryers will reduce the need for paper towels. Bad odors are common in school restrooms. Make sure to install air purifiers and air fresheners. You can also install a fan or a window to let fresh air in. The most important thing is to keep your school restrooms well cleaned. Hire a professional cleaning service to come on a regular basis and clean and disinfect the restrooms. Contact us for help with your school cleaning needs.